Why have four to ten-foot lengths of gutter besmirching the landscape as it runs out at an angle through the shrubs, its duty to carry water from the end of the gutter downspout to a point safely away from the foundation, when one can accomplish the same thing, virtually invisibly? We’re now installing NDS water displacement systems in over half of our jobs, and nearly every job where we’re renovating a tired, old, house foundation planting. It’s a simple DIY project for homeowners. All you’re doing is removing the curved, final elbow in your downspouts around the house, and digging a small hole directly beneath the remaining vertical downspout. Into this hole you place an NDS Spee-D basin. They’re black, plastic, and come in various sizes, with an option of one or two egress openings. Unless you have a walloping amount of water coming down a downspout, you need only the smallest basin, with one, four-inch opening. This is what’s underground in the photo above. 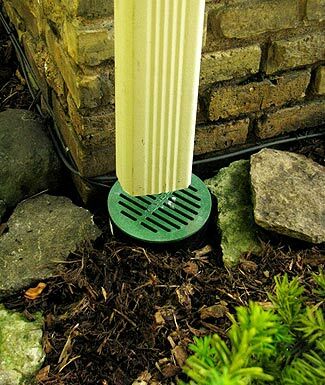 If the distance from the end of the vertical downspout to the top of the grate on the Spee-D basin is more than six inches, you may want to cut a section of downspout from the old piece you are replacing, and extend the downspout so it’s closer to the grate. You shortened the length of the downspout as it runs down the side of your house, remember, when you removed the elbow. Extending the vertical downspout will reduce splash, and look better. Next you dig a five-inch-wide trench from the basin out into the lawn, or to whatever point you’d like the water to flow to. Buy a trenching shovel, they come in handy. 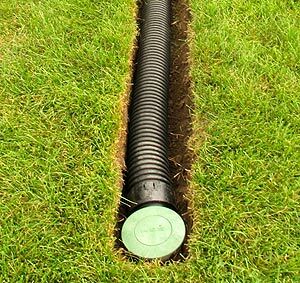 You attach four-inch ribbed plastic drain tile to the opening on the side of the basin – it snaps into place, no tools required – and place it in the trench. It’s good if this trench leads slightly downhill, but can run flat. You cannot run the drain tile uphill. At the end of the trench, you place an NDS pop-up emitter unit. 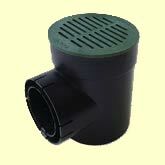 It’s a heavy-duty plastic elbow with a green circular cap on a hinge that opens up to let the water flow out. This also snaps onto the drain tile. At both the basin and the emitter unit, push the ribbed drain tile deeply and firmly into the plastic NDS units. You’ll hear it snap into place. Now fill in the trench, replace the sod if applicable, and there you have it. Rainwater is now carried underground from the downspout out and away from the house foundation. You can purchase these NDS units, and drain tile, at the big box stores, but one very important caveat: At these stores, often I see only those NDS units designed for use with four-inch PVC pipe. Same principle, except these NDS units are meant to be glued to rigid PVC pipe. They look similar to the NDS units designed for use with drain tile, and will in fact fit over drain tile, except some water will leak from both the basin and emitter head, as they lack the double-rim coupling opening designed for use with ribbed drain tile. Better to purchase the correct units from a landscape supply company, irrigation outfit, or ask at the box store. Just be sure you are purchasing NDS units meant for use with drain tile. Or, use PVC pipe in the trench, I guess, which is the old system, except it’s more expensive, you have to glue everything together, and you can’t curve it. Here is a link to the NDS website for more information. Run your cursor over “Our Products” and select “Drainage Systems” from the pull-down.